Key words: Heavy metal resistance, genomic islands, environmental bacteria, biomining, metal bioremediation, mobile genetic elements. Many environmental microorganisms have adapted to the presence of toxic heavy metals. In general, when cellular metals concentrations exceed acceptable levels, mechanisms of resistance are activated in order to survive this adverse environment (Rensing and Grass, 2003; Franke and Rensing, 2007; Magnani and Solioz, 2007; Kim et al., 2010; Dupont et al., 2011). In Gram-negative bacteria, one of the pathways described for metal resistance is the active efflux of metal from the cytoplasm to the periplasmic space, carried out by ATPases located in the internal membrane of the bacteria (Rensing and Grass, 2003). Some microorganisms may pump metal from the cytoplasm directly to the extracellular space by systems of the RND (resistance nodulation cell division) family of carriers, the Cus system of E. coli being the best known of this kind of detoxification organization (Outten et al., 2001). The capacity of some species to bind the metal in the periplasmic space by means of metal chaperones has also been reported for copper (Puig et al., 2002; Kim et al., 2010). An important strategy used by all microorganisms to survive a toxic flux of metals is the formation of biofilms. Metal sequestration takes place in biofilms since extracellular polymers, cell membranes and cell walls of the microbial community provide many cationic and anionic sites for the interaction with metal ions and their biosorption (Harrison et al., 2007). In the environment of biomining microorganisms, copper and other nominal metal concentrations are one or two orders of magnitude greater than those tolerated by neutrophiles (Remonsellez et al., 2006; Orell et al., 2010; Orell et al., 2013). However, since the growth conditions of these two types of bacteria are completely different the comparison cannot be directly made. As already mentioned, these apparent metal resistance differences might be due in some cases to a different availability of the metals and differences in uptake of cations between neutrophiles and acidophiles. Acidophilic microorganisms have several active mechanisms to withstand their extremely acidic environment (Dopson et al., 2003; Franke and Rensing, 2007; Krulwich et al., 2011). In addition, some passive mechanisms of pH homeostasis have been proposed to support the active mechanisms. Some strategic changes in proton permeability of the membrane and cell surface changes have been thought to delay proton entry into or loss from the cytoplasm (Krulwich et al., 2011). Examples of these possible passive systems have been reported for A. ferrooxidans, the most studied biomining bacterium. This microorganism has an unusual pI profile which may not only address functional needs but could also provide a passive contribution to the active mechanisms for pH homeostasis (Jerez, 2013). Surface proteins in A. ferrooxidans have high pI values relative to neutrophilic bacteria, so their positive charges could act as a transient proton repellent at the cell surface (Chi et al., 2007). Adjustments of membrane lipids and porins have also been proposed in A. ferrooxidans to minimize inward proton leakage during acid stress (Krulwich et al., 2011 and references therein). Porins are organized in trimeric structures that form water-filled channels that allow diffusion of small molecules through the outer membrane. Each monomer constitutes a discrete pore. Within each pore of OmpC from E. coli a long polypeptide loop (L3) runs along one side of the barrel wall and narrows the pore to create an "eyelet" region (Nikaido, 1994). The net electric charge of these loops 3 is important for the permeability of the molecules passing through the pore. Comparing a cross-section of a pore from E. coli and one possibly existing in OMP40, the major porin from A. ferrooxidans (Guiliani and Jerez, 2000), the net charge of loop 3 in A. ferrooxidans would be +2 at its usual growth pH of 2.5, while the equivalent loop in the neutrophilic E. coli would have a net charge of -4 at its growth pH of 7.0. Therefore the A. ferrooxidans loop could act as a proton barrier to control the free entry of protons from the outside and thus avoid excessive acidification of their periplasmic space (Guiliani and Jerez, 2000; Jerez, 2013). A great reduction in the expression levels of OMP40 has been observed by quantitative proteomics in A. ferrooxidans ATCC 233270 cells grown in the presence of copper, strongly suggesting a change in the permeability of the outer membrane to decrease copper ion entrance to the cell and thus to prevent toxicity of the heavy metal (Almárceguie et al., 2013a). Thus the properties of OMP40 would not only be a passive strategy as already mentioned but would function together with other envelope proteins such as a new RND-type efflux pump and a putative periplasmic disulfide isomerase, both being apparently regulated copper-resistance determinants in this extremophile (Almárcegui et al., 2013b). A similar result has been observed in Pseudomonas aeruginosa, in which a reduced expression of eight different porins was seen when cells were exposed to copper (Teitzel et al., 2006). Horizontal gene transfer (HGT) is considered to be an important mechanism for the evolution of microbial genomes, since together with gene loss and other genomic alterations, gene acquisition has an important role in the adaptive evolution of microorganisms (Dobrindt et al., 2004). Great advances have been made over the past ten years in understanding the mechanisms of genomic variability and evolution of bacterial pathogens, especially due to the interest in knowing the mechanisms of antibiotic resistance in pathogenic bacteria. Knowledge of HGT in environmental microorganisms present in natural ecosystems has also begun to accumulate (Aminov, 2011). Recent comparison of gene-transfer networks amongst hundreds of sequenced genomes has suggested that on average 20% of the genes have been recently acquired (Popa et al., 2011; Polz et al., 2012). Highly sophisticated natural genetic engineering tools in the form of a variety of mobile genetic elements (MGEs) are considered to be central to HGT-driven bacterial evolution and adaptation (Dobrindt et al., 2004; Aminov, 2011). Although new classifications of MGEs are continuously appearing, in general they include conjugative transposons, integrons, plasmids, bacteriophages, genomic islands (GIs), transposons and insertion sequence elements (Dobrindt et al., 2004; Aminov, 2011). GIs are large chromosomal regions that are part of a flexible gene pool. These DNA regions would have been previously transferred by other MGEs and they carry one or more genes that can increase the adaptability and versatility of the microorganism. They have been defined in general as clusters of genes having one or a set of the following properties (Dobrindt et al., 2004; van Houdt et al., 2009): a tyrosine-based site-specific recombinase gene and an adjacent tRNA gene at one extremity; flanking insertion sequence elements; a base composition and/or phylogeny differing from the bulk of the genome, indicating acquisition through HGT; higher content of hypothetical genes than neighboring regions; clustering of genes characteristic of MGEs such as recombinase genes and IS elements; conservation of the GI between different (unrelated) hosts; a high concentration of genes specialized for resistance, catabolism and unusual metabolism. In the present mini-review we will focus on recent findings related to metal resistance mechanisms and to the role of GIs that confer high metal resistance in some acidophilic environmental microorganisms of importance in biomining and bioremediation of metal-polluted environments. Important related reviews og non-acidophilic environmental microorganisms are also available (Von Rozycki and Nies, 2009; Boyd et al., 2009; Hemme et al., 2010; Mijnendoncx et al., 2011). Acid mine drainage (AMD), usually derived from biomining operations to recover metals, contains highly toxic elements and a very low pH (Mohapatra et al., 2011; Jerez, 2011). Nevertheless, several microorganisms are associated with this extreme environment. Among these bacteria and archaea, Thiomonas are found, especially in AMD containing levels up to 6 mM of inorganic forms of arsenite (As(III)) (Table 1) and arsenate (As(V)) (Arsène-Ploetze et al., 2010). Thiomonas arsenitoxydans (formerly Thiomonas sp. 3As) belongs to the Beta-proteobacteria and is a facultative chemolithoautotroph, moderate acidophile (pH 5), able to grow optimally in mixotrophic media containing reduced inorganic sulfur compounds and organic supplements (Bryan et al., 2009, Duquesne et al., 2008). Thiomonas spp. have been described as being capable to oxidize arsenite. These microorganisms may be quite useful to minimize the toxicity of As(III) in arsenic-polluted environments (Duquesne et al., 2008). The genome of T. arsenitoxydans (Slyemi et al., 2011) contains a circular chromosome of 3.7 Mpb and a plasmid (pTHI) of 46.8 Kpb (Arsène-Ploetze et al., 2010). The circular chromosome contains 19 GIs (ThGEI-A-ThGEI-S) that were acquired by HGT. It has been proposed that these GIs confer a series of adaptive advantages to the bacterium to colonize its niche efficiently, such as the acquisition of genes coding for genetic products implicated in heavy metal resistance. On the other hand, plasmid pTHI contains 68 coding regions. among which 14 would potentially code for proteins involved in conjugation. It has been suggested that T. arsenitoxydans may be able to express a complete type IV secretory system that would be required directly for DNA and protein translocation to the outside of the bacterial cell (Arsène-Ploetze et al., 2010). Regarding heavy metal resistance, T. arsenitoxydans has two GIs coding for operons related to copper resistance: ThGEI-J, containing a partial cus operon, and ThGEI-O, that includes genes coding for partial cop and cus systems (Arsène-Ploetze et al., 2010). These authors compared the genome of T. arsenitoxydans to the genome of several other Thiomonas strains. They found that their flexible gene pool evolved to allow their growth and survival in their toxic environment. The results of Arsène-Ploetze et al, 2010 suggested that the natural environment influences the genomic evolution of these bacteria. As in the case of A. ferrooxidans to be reviewed in the next section, the acquisition by strains of the same species of different GIs highlights the genomic variability within a given taxonomic group. A. ferrooxidans is a Gram-negative, acidophilic chemolithoautotroph that can use ferrous iron, reduced species of sulfur or metal sulfides as energy sources (Vera et al., 2013; Rawlings, 2005; Valenzuela et al., 2006; Jerez, 2008; Jerez, 2011). As shown in Table 1, some strains of A. ferrooxidans can resist exceptionally high copper (up to 800 mM CuSO4) and other metal concentrations (Dopson et al., 2003; Orell et al., 2010). This property is important for the use of this microorganism in biomining processes, where copper levels usually range between 15 and 100 mM CuSO4 (Watling, 2006; Watling et al., 2010). A. ferrooxidans ATCC 23270 can survive high copper concentrations by having in its genome at least ten genes that are possibly related to copper homeostasis. These include three genes coding for putative ATPases related to the transport of copper (copA1Aƒ, copA2Aƒ, and copBAƒ), three genes related to a system of the RND family, involved in the extraction of copper from the cell by using the proton motive force (cusAAƒ, cusBAƒ, cusCAƒ), and two genes coding for periplasmic chaperones for this metal (cusFAƒ and copCAƒ) (Navarro et al., 2009). The expression of most of these open reading frames (ORFs) was studied by real time RT-PCR (qRT-PCR) using A. ferrooxidans cells that were adapted to grow in the presence of high concentrations of CuSO4. These A. ferrooxidans copper-resistance determinants were found to be upregulated when this bacterium was exposed to CuSO4 in the range of 5 to 25 mM and conferred to E. coli a greater resistance to copper compared to wild-type cells, supporting their functionality (Navarro et al., 2009). The genomic sequence of A. ferrooxidans ATCC 53993 contains all the copper-resistance genes present in A. ferrooxidans ATCC 23270 that have been experimentally confirmed as being expressed in the presence of copper, except that strain ATCC 23270 contains a second Cus-like operon interrupted by a transposase gene which is absent in the genome of strain ATCC 53993 (Luo et al., 2008; Navarro et al., 2009; Orell et al., 2010; Orellana and Jerez, 2011). These ORFs have 100% identity between their corresponding DNA sequences. However, A. ferrooxidans ATCC 53993 contains several additional putative metal-resistance ORFs that confer it higher metal resistance (Orellana and Jerez, 2011). These putative genes are clustered in a 160 kb GI that is absent in the genome of A. ferrooxidans strain ATCC 23270 (Orell et al., 2010; Cardenas et al., 2010). On the other hand, strain ATCC 23270 has a 300 kb region that does not contain metal resistance-related genes and is absent in the genome of strain ATCC 53993 (Cardenas et al., 2010; Bustamante et al., 2012). Genomic strain variations have also been found in the acidophilic Leptospirillum group II by deep metagenomic genome sequence analysis (Simmons et al., 2008). It is possible that HGTs shared by A. ferrooxidans strains and other microorganisms are key elements to supplement metal resistance and possibly other properties, thus conferring adaptive advantages to all these microorganisms. The GI found exclusively in A. ferrooxidans ATCC 53993 contains genes encoding heavy metal resistance determinants, such as those involved in mercury detoxification (merA), incorporation of the metal to the cytoplasm where it is reduced and volatilized (merC) and the transcriptional regulator (merR), as well as a copper translocating P-type ATPase. This GI is inserted after ORF Lferr0127, which has been annotated as an enzyme related to t-RNA metabolism (MiaB type). Six ORFs possibly related to Cu-resistance are present in this GI: a P-type ATPase annotated as a possible Cu-resistance determinant or copA3Aƒ (Orellana and Jerez, 2011). All Cop-like proteins found so far in A. ferrooxidans, including CopA3Aƒ, contain the metal binding motifs that are highly conserved in Cop proteins from other microorganisms (Orell et al., 2010). Other ORFs found in the GI of A. ferrooxidans ATCC 53993 corresponded to members of a putative Cus system (cusA3Aƒ, cusB3Aƒ and cusC3Aƒ). Two additional possible CusF-like chaperones previously described in A. ferrooxidans ATCC 23270 (Navarro et al., 2009) were found in this GI (Orellana and Jerez, 2011). The copper-binding site of E. coli CusF contains one His and two Met in addition to an unusual Trp that presumably interacts with copper through a cation-π interaction (Xue et al., 2008). All the putative CusF-like proteins from A. ferrooxidans strains ATCC 23270 and ATCC 53993 contain a Met instead of a His in their putative binding sites (Orell et al., 2010). In addition, their amino acid sequences have possible signal peptides, suggesting that all are exported, most likely to the periplasmic space. A. ferrooxidans ATCC 53993 has a much higher resistance to CuSO4 (>100 mM) than that of strain ATCC 23270 (<25 mM) (Orellana and Jerez, 2011). As occurs in Cupriavidus metallidurans, it was expected that the additional multiplicity of possible copper resistance determinants in the GI of A. ferrooxidans ATCC 53993 would confer it a higher tolerance to the metal compared to strain ATCC 23270. Although both strains have similar growth in the absence of copper, cell numbers of ATCC 23270 were reduced 7-fold when grown in 100 mM CuSO4, whereas those of ATCC 53993 were diminished by only 2-fold (Orellana and Jerez, 2011; Jerez, 2013). This additional capacity of strain ATCC 53993 to tolerate copper should give it an adaptive advantage when growing in a microbial consortium such as the one usually found in their habitat. If these two A. ferrooxidans strains were present in a bioleaching operation such as a heap or more likely in an industrial biooxidation reactor, as copper concentration increases with the dissolution of the mineral, at the end of the operation strain ATCC 53993 should predominate over ATCC 23270. A preliminary test of this idea was carried out by growing a mixture of approximately equivalent numbers of each strain in the presence of copper. The relative proportions of each kind of bacterium were estimated by means of qPCR by using strain-specific primers. These results clearly indicated that A. ferrooxidans ATCC 53993 was able to outgrow strain ATCC 23270 in the presence of 50 mM CuSO4 (Orellana and Jerez, 2011; Jerez, 2013). Furthermore, an upregulation of the transcriptional expression of most of the additional Cu-resistance genes present in the GI of A. ferrooxidans ATCC 53993 was observed when cells were grown in the presence of increasing CuSO4 concentrations. These genes were also functional when expressed in E. coli, strongly supporting the functionality of the copper-resistance determinants present in the GI of A. ferrooxidans ATCC 53993 (Orellana and Jerez, 2011). These findings constitute the first experimental evidence for high copper resistance due to the expression of genes present in a GI of an acidophilic chemolithoautotrophic bacterium. It will be of great interest to establish in future studies whether all the remaining putative and hypothetical genes present in the GI of A. ferrooxidans ATCC 53993 have a role in conferring the bacterium extra resistance, not only to copper but also to several other metals found in bioleaching habitats. Interestingly, when A. ferrooxidans strains ATCC 53993 vs ATCC 23270 subjected to 0/40 mM copper were analyzed by differential quantitative proteomics, only 3 proteins changed in the former vs 16 proteins in the latter (unpublished results). This greatly diminished response to the metal is in good agreement with the much higher copper resistance of A. ferrooxidans ATCC 53993 already described. Clearly then, the reason for resistance to copper of two strains of the same acidophilic microorganism could be determined by slight differences in their genomes generated by genetic exchanges. These inter-population interactions may not only lead to changes in the capacities of the bacteria to adapt to their environment, but may also help to select the more fit microorganisms for improvement of industrial biomining operations. A preliminary study of the response to copper of an A. ferridurans strain D2 isolated from a copper bioleaching operation in Atacama Desert, Chile has been reported. By using whole-genome DNA microarrays, genes related to copper stress response were found to be upregulated. In addition, some genes related to other metabolic pathways were repressed, probably because of the energy cost of the stress response (Salazar et al., 2013). Apparently, acidophilic microorganisms use similar metal homeostatic strategies to those of neutrophils. In a recent study of zinc tolerance in Acidithiobacillus caldus ATCC 51756 and other microorganisms using bioinformatics analysis (Mangold et al., 2013), the authors predicted the presence of several zinc transporters for putative metal -import or -export which are found in other microorganisms. However, they found experimentally that many of the putative zinc homeostasis genes were constitutively expressed and with one exception, they were not upregulated in the presence of excess zinc (Mangold et al., 2013). They proposed that possible solution effects might influence the toxicity of the tested metal. Zinc speciation modeling of the growth media demonstrated that a large fraction of the free metal ion was complexed, potentially affecting its toxicity in spite of the high nominal zinc concentrations used (Mangold et al., 2013). Considering this report, a similar case could occur for Zn and other metals such as copper in other acidophilic microorganisms. However, the aforementioned much greater copper resistance of A. ferrooxidans strain ATCC 53993 compared to strain 23270 subjected to the same copper concentrations could not be attributed to this possible metal complex formation, since the solution conditions would be equivalent for both types of microorganisms. Our bioinformatic analysis of the putative zinc transporters reported for A. caldus ATCC 51756 (Mangold et al., 2013), showed that all of them were also present in the genome of A. caldus SM-1. In addition, the latter strain contains seven genes in its megaplasmid pLAtcm (You et al., 2011) that may also be involved in Zn resistance. Atc_m073 could be involved in zinc entrance to the cell, since it codifies for an NRAMP family protein that may be involved in cation transport. The other six genes may be involved in zinc efflux. Atc_m084-m082 would form an RND type efflux system similar to ZntA. Genes Atc_m074 and Atc_075 could code for two CDF type proteins similar to CzcD, and finally, Atc_m086 is a possible P-type ATPase. Regarding copper tolerance of A. caldus, a copper MIC of 24 mM has been reported for strain DSM8584 (Watkin et al., 2008) (Table 1). Recently, the response of a Chinese strain of A. caldus to copper stress was analyzed (Xia et al., 2010). The authors found a negative effect on the activity of some of the enzymes involved in sulfur metabolism, such as sulfite oxidase and APS reductase. Nevertheless, no direct evidence was reported to support the idea of overexpression of a Cu-specific inducible ATPase pump that the authors speculated that would be present under their study conditions. Some of the genes related to zinc resistance reported in A. caldus ATCC 51756 (Mangold et al., 2013) and those already mentioned for the megaplasmid of strain SM-1 that may be possible zinc transporters could also be involved in copper transport (see Table 2). Specifically, the RND type efflux systems and P-type ATPases, since these genes have been previously reported as related to copper resistance in A. ferrooxidans ATCC 23270 (Navarro et al., 2009; Orellana and Jerez, 2011). Both strains of A. caldus contain a variety of genes coding for putative copper resistance-related proteins, since they showed a high degree of identity (between 50 and 90%) with those known for A. ferrooxidans (Navarro et al., 2009; Orellana and Jerez, 2011). These two strains of A. caldus share several of these genes in their chromosomal DNA, such as the components of an RND-type efflux pump (CusABC), two P-type ATPases (CopB), two cytoplasmic metalochaperones (CopZ) and a copper oxidase (CueO) (Table 2). However, the megaplasmid pLAtcm present in strain SM-1 (You et al., 2011) contains a great variety of genes related to heavy metal resistance. Specifically, six of these genes may be involved in copper resistance. Except for CueO, all the copper resistance determinants present in the chromosome of A. caldus strain SM-1 are duplicated in the megaplasmid (Table 2). Interestingly, a gene coding for a putative periplasmic copper chaperone (CusF), which has been described in E. coli (Loftin et al., 2005) and in A. ferrooxidans ATCC strains 23270 and 53993 (Orell et al., 2010; Orellana and Jerez, 2011), is also present in the pLAtcm megaplasmid but absent in the chromosomal DNA from both ATCC 51756 and SM-1 A. caldus strains (Table 2). Are canonical metal resistance determinants able to confer high metal tolerance to microorganisms? C. metallidurans CH34 contains many genes for copper resistance and has a MIC value of 3 mM for copper (Monsieurs et al., 2011). On the other hand, P. syringae pv. tomato containing only one copRSABCD operon for copper resistance has also a MIC value of 3 mM (Nakajima, 2002). In addition, some microorganisms such as A. ferrooxidans ATCC 23270 or Metallosphaera sedula that do not contain metal resistance genes in their GIs, are still highly resistant to heavy metals (Table 1). This suggests that there is not always a direct correlation between the number of genes related to metal resistance and greater metal resistance in all microorganisms. Previous reports have indicated that A. ferrooxidans ATCC 23270 resists copper in part by the use of a combination of an ample collection of recognized copper resistance genes (Orell et al., 2010; Wu et al., 2010). A. ferrooxidans ATCC 53993 has a much higher resistance to copper than strain ATCC 23270 most likely due to the presence of the exclusive GI in the former. Nevertheless, at present the participation of other unknown genes in the high Cu-resistance of strain ATCC 53993 cannot be discounted. As already pointed out in Table 1, A. ferrooxidans strains are able to grow in extremely high CuSO4 concentrations (Das et al., 1998; Wu et al., 2010). Other non-acidophilic microorganisms able to grow in the presence of several toxic metals, such as C. metallidurans, tolerate CuSO4 in a much lower range (1.5 to 12.5 mM) (Chen et al., 2008). Nevertheless, this property of C. metallidurans has also been attributed to the occurrence of a great variety of metal resistance determinants, many of them present in GIs (van Houdt et al., 2009). Although as already mentioned it is not possible to compare MIC values of microorganisms growing in entirely different media, the presence of metal resistance genes in genomic islands may be a general strategy used by environmental microorganisms to tolerate high levels of toxic metals. Is a PolyP-based metal resistance mechanism present in all highly metal resistant microorganisms? The existence in acidophiles of genes with similarity to most of the Cu-resistance determinants contained in neutrophilic microorganisms does not completely explain the much higher metal resistance of the former microorganisms. One of the possible additional mechanisms proposed for metal resistance is the sequestration of metal cations with long polymers of inorganic polyphosphate (polyP) (Rao et al., 2009; Keasling, 1997). PolyP is a linear polymer of hundreds of orthophosphate residues linked by phosphoanhydride bonds. The main enzyme involved in the biosynthesis of polyP is the polyphosphate kinase (PPK) that catalyzes the reversible conversion of the terminal phosphate of ATP into polyP. On the other hand, an exopolyphosphatase (PPX) is known to hydrolyze polyP, liberating inorganic phosphate (Pi) (Rao et al., 2009). PolyP is synthesized by PPK in A. ferrooxidans or other bacteria (or by a yet unknown equivalent archaeal enzyme) using ATP (Jerez, 2011; Orell et al., 2010; Orell et al., 2012). Several biomining microorganisms have been shown to accumulate electron-dense granules composed of polyP as seen in the bacteria A. ferrooxidans, A. caldus, A. thiooxidans and in the archaea Sulfolobus metallicus and M. sedula (Orell et al., 2010; Orell et al., 2012). In this regard, polyP granules have also been observed in electron micrographs of thin sections of T. arsenitoxydans (Arséne-Ploetze et al., 2010). Copper-resistance determinants were searched in the genomes from A. caldus strains SM-1 and ATCC 51756 by making a BLAST search using the sequences of copper-resistance related proteins previously reported in A. ferrooxidans ATCC 23270 (Navarro et al., 2009) and 53993 (Orellana and Jerez, 2011): CusCFBAAƒ , CopAAƒ , CopBAƒ and CopCAƒ'or in E. coli (EcCueO) and B. subtilis (BsCopZ). Thus a polyP-dependent system for Cu-resistance has been proposed for A. ferrooxidans (Alvarez and Jerez, 2004) and S. metallicus (Remonsellez et al., 2006), reviewed in Orell et al., (2012). This resistance mechanism is based on the observed in vitro activation of PPX by the presence of intracellular copper (Alvarez and Jerez, 2004). The phosphate released from polyP would form a metal-phosphate complex that would be eliminated from the cell through inorganic phosphate transporters (Pho84 type, since the acidophiles discussed here do not have the standard Pit-like bacterial phosphate transporters). In excess of ADP generated by the use of cellular ATP, the reverse reaction of PPK synthesizes additional ATP from polyP. In this way, the reserve polyP would also be supplying energy to the metal detoxifying systems. A similar mechanism may also exist in Sulfolobales (Orell et al., 2010; Orell et al., 2012; Orell et al., 2013). Although the proposed mechanism for metal resistance needs to be proven, it may be eventually functional in all polyP-accumulating biomining microorganisms (Orell et al., 2010) (see Fig. 2). While a connection between pH homeostasis and metal homeostasis is not yet clear, it is a known fact that polyP has a high buffering capacity, being able to neutralize protons and metals that could be incorporated into the cytoplasm (Rao et al., 2009). In this connection, it has been proposed that cytoplasmic buffering in T. arsenitoxydans can be mediated not only by amino acid decarboxylation but also by polyP granules (Arsène-Ploetze et al., 2010). Recently, Mangold et al., 2013 also reported by means of a bioinformatics analysis that A. caldus ATCC 51756 contains all the genes putatively involved in the polyP-based resistance mechanism. Regarding the system needed to incorporate inorganic phosphate into the cells, A. ferrooxidans contains in its genome a putative Pho regulon including the genes phoB, phoR, pstS, pstC, pstA, pstB, phoU, ppx and ppk (Vera et al., 2003). Some differences were seen in the organization of the genes from A. ferrooxidans compared to the Pho operons from other bacteria. This was especially evident in the organization of the genes involved in polyP metabolism (ppk and ppx). E. coli has both ppk and ppx genes in the same operon (Rao et al., 2009), while A. ferrooxidans does not (Vera et al., 2003). Therefore, if the E. coli genes are co-regulated at the transcriptional level it is difficult to envisage an accumulation of polyP granules, since the two enzymes have opposite activities (synthesis versus degradation of polyP). In fact, E. coli only transiently increases polyP synthesis under adverse conditions, and no polyP granules have been reported in wild type strains of this bacterium. One could speculate that microorganisms having the ppk and ppx genes organized in separate operons could regulate synthesis and degradation of polyP separately, allowing them to accumulate these polymers in response to stressing conditions. As already mentioned, this is in agreement with the great capacity of A. ferrooxidans to accumulate polyP granules. A. caldus, which also accumulates polyP granules, (Orell et al., 2012) also contains a putative Pho regulon (Mangold et al., 2013). 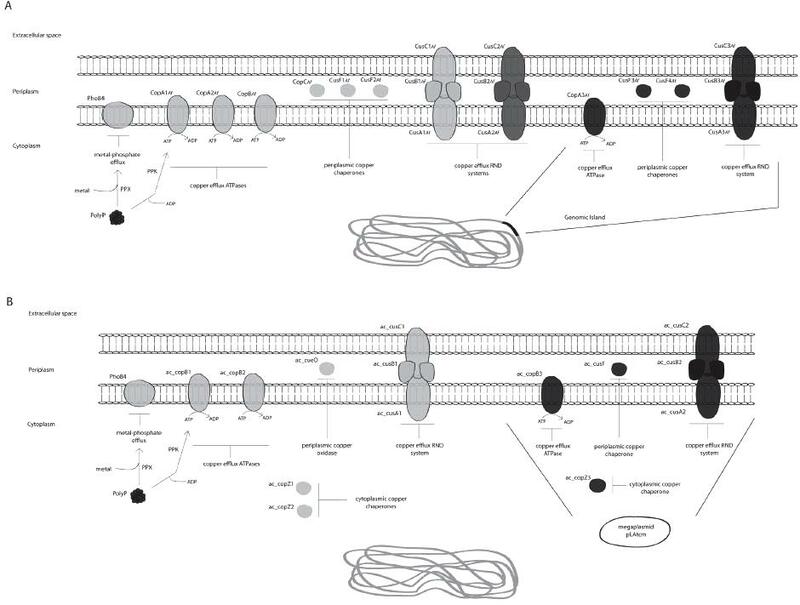 Figure 1 shows the genomic contexts of Pho regulons for A. ferrooxidans and A. caldus. Both kinds of acidophiles have ppx forming part of their respective putative operons and ppk is separated from the pstS systems. Considering the similarity between these genes and their contexts, it may be suggested that these bacteria have similar ways to respond to copper and other metals, as suggested in the working models illustrated in Fig. 2. When external Cu concentration increases, all of the Cu resistance determinants from A. ferrooxidans or A. caldus would be expressed at higher levels to eliminate Cu from the periplasm or cytoplasm of the cells. This requires high levels of ATP to activate the metal efflux ATPases and could be provided from polyP by the reverse reaction catalyzed by PPK in the presence of excess ADP in the cell. Figure 1. Putative PHO regulon in A.ferrooxidans and A. caldus. Both A. ferrooxidans strains ATCC 23270 and 53993 contain the same genes and in the same order in their respective genomes. Both A. caldus strains ATCC 51756 and SM-1 contain the same genomic context for the putative PHO regulon genes, which is different than that of A. ferrooxidans strains. Figure 2. Working model comparing the copper resistance determinants from A. ferrooxidans and A. caldus. A. 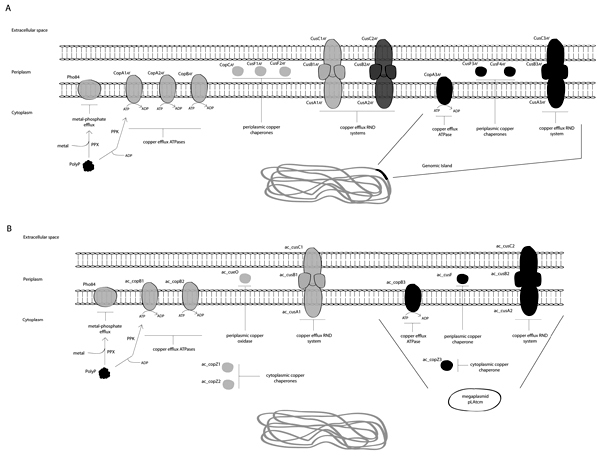 Scheme of A. ferrooxidans ATCC 53993 showing copper efflux ATPases, copper chaperones, copper efflux RND systems and the phosphate transporter Pho84 previously reported for A. ferrooxidans ATCC 23270 (Navarro et al., 2009; Orellana and Jerez, 2011; Almárcegui et al., 2013a). In addition, the extra proteins involved in copper resistance coded for in its exclusive genomic island are also included. Both A. ferrooxidans strains contain the same copper resistance genes in their genomes, except for those present in the genomic island of ATCC 53993. B. Proposed possible copper resistance determinants for A. caldus strain SM1 based on bioinformatics analysis and similarity comparison (Table 2) with the genes previously described for copper resistance in A. ferrooxidans. Current knowledge indicates that key elements involved in metal resistance in environmental microorganisms appear to be a wide repertoire of known metal-resistance determinants and their duplication, the presence of novel metal-chaperones and abundant reserve of inorganic polyphosphate (polyP) used in a polyP-based copper resistance system. The study of novel metal resistance determinants in environmental microorganisms will also help with the functional annotation of these genes in the increasingly available genomic sequences from environmental extremophilic bacteria and archaea. Horizontal gene transfer by means of mobile genetic elements such as genomic islands plays an important role in increasing the adaptability and versatility of environmental microorganisms living in environments with high metal concentrations. The characterization of metal resistance determinants will not only contribute to our understanding of the mechanisms that acidophilic bioleaching and other microorganisms use to adapt to their extreme environments but to eventually improve biomining or metal bioremediation processes as well. This could be achieved by using the fittest bacteria in these industrial processes. The authors thank FONDECYT 1110214 and ICM P-05-001-F projects. POPA O, HAZKANI-COVO E, LANDAN G, MARTIN W, DAGAN T (2011) irected networks reveal genomic barriers and DNA repair bypasses to lateral gene transfer among prokaryotes. Genome Res 21: 599-609.